In thermal shock chambers, the extreme simulation of temperature is conducted within two zones of hot and cold. These zones are controlled independently of each other; a single basket product carrier can be moved between these zones, subjecting the specimen to dramatic changes in temperature, thus subjecting the test subject to a thermal shock and thereby detecting flaws. Alphatech is the exclusive agent of Aralab climatic and thermal shock chambers manufacturer from Portugal and the CME environment system from India. Aralab is a company specialized in designing, developing, manufacturing and servicing of high quality Climatic and thermal shock chambers. For more than 25 years Aralab have been perfecting ways to create and control temperature, humidity and many other environmental conditions that respond to the needs of customers all around the world. 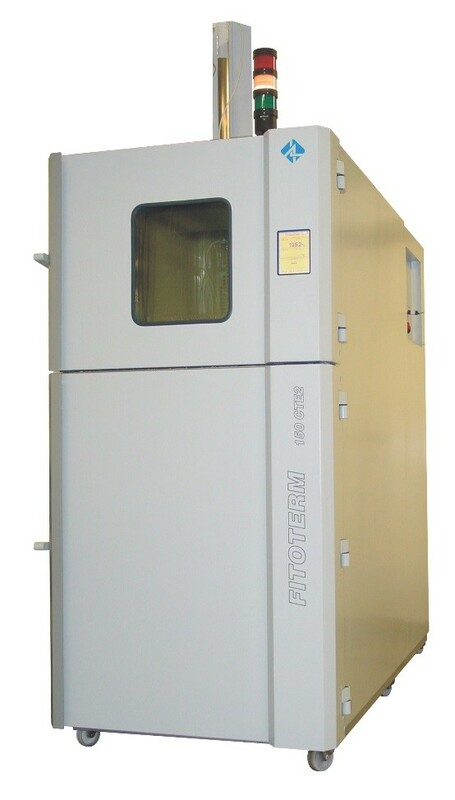 The temperature shock test chamber features two independent chambers on the same chassis, with the upper (hot) chamber – heated by electric heaters and air circulation – reaching uniform temperatures of 200°C and the lower (cold) chamber – with dynamic ventilation +/- 2 m/s for homogenization and temperature uniformity – reaching cold temperaturs down to -75°C. The temperature shock test is carried out by transferring the test specimens between the two chambers through an electro-mechanical lift, with +/- 5 seconds of transfer time. Aralab’s evolution of the mechanical lifting system made possible to eliminate all vibrations on the lifting cradle, making a smooth up and down movement while performing the tests. For more detailed information regarding Aralab Thermal Shock Chamber, please click here.